Tis the season for holiday cheer – and you can get in on the action by singing loud for all to hear at Caroling at Cloud Gate. Bundle up for harmonies and skyline views as you join Janet Sutton & the Voices of ACME in belting out some holiday classics. 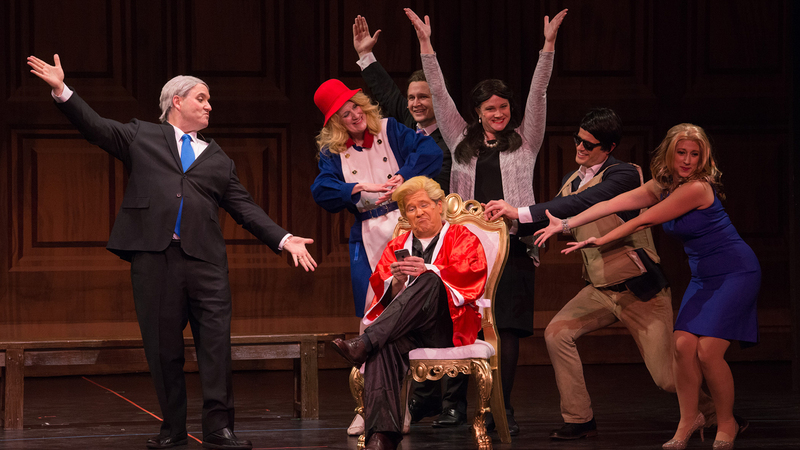 No politician is safe as more than 50 attorneys take the stage to perform skits, musical numbers and parodies at “Big Little Laws.” Expect imitations of outgoing Mayor Rahm Emanuel and his slew of challengers, President Donald Trump and press secretary Sarah Huckabee Sanders, plus recent midterm election winners. One-of-a-kind gifts (for those lucky enough to be on your nice list) await your perusal at the Renegade Craft Fair. More than 200 artists showcase their wares, from jewelry to handmade candles to vegan skincare products and everything in between. Warm up with a seasonal cocktail while you shop, groove to DJ sets by Reckless Records and Lumpen Radio, and nosh on local bites. The 2018 Holiday House Tour features architectural gems in Norwood Park from the late 1800s to the 1900s. See how homeowners have blended the past and present in their historic homes. Stop in the oldest surviving house in Chicago (built in 1833) for Victoria’s Holiday Craft Boutique and Holly Daze Café. Walk, drive or take a shuttle to each of the homes. The Real Dog Moms of Chicago host a two-hour long DIY Howliday Ornaments party to benefit Chicago dog rescue and no-kill shelter One Tail at a Time. Create ornaments inspired by your own fur babies using wood, felt, clay, vinyl, cork and paint. Sugar plum fairies and mouse kings of all ages and abilities are invited to the annual Dance-Along Nutcracker, where they can point their toes and twirl to Tchaikovsky’s holiday classic. Kiddos can learn ballet basics from 11 a.m. to 2 p.m. from Ballet Chicago members. You can sneak everything in this weekend when you bend, stretch and sip craft brews at Beer Yoga at Revolution. The power yoga class will be taught by Katie Palmer of SK Yoga Chicago on the taproom floor among the barrels of beer and giant American flag. BYO mat, towel and water. Stick around for a post-shavasana beer. On the hunt for classic holiday décor? A Vintage Holiday Market has you covered, from vintage ornaments to Santa figures, Christmas cards and gifts to help you work your way down your holiday shopping list. Ready to tap into your creative side? Shedd Aquarium’s Adult Programs: Wine and Waves teaches you about an underwater animal habitat before you dive into an artist-led painting class. Not very artistic? No need to fear – an artist will guide you through the process. Cash bar. Gender, sexuality, race and politics of the 1960s and ‘70s are the focus of “The Many Hats of Ralph Arnold: Art, Identity & Politics.” The South Side artist delves into these topics, framed by his own identity as a black, gay veteran. Explore his photocollages, along with works by contemporaries and colleagues Robert Rauschenberg, Ed Paschke and Barbara Jones-Hogu.